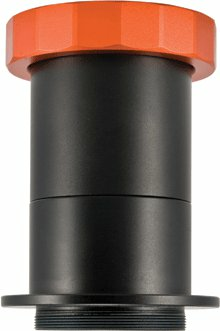 The Celestron T-Adapter CGEM Edge HD 8" is used to screw a single reflex camera -which is fitted with a T thread adapter- onto the telescope tube, enabling you to take photographs in the primary focal point (without eyepiece). This way, your telescope acts as a telelens. It is also possible to take photographs with an eyepiece. This is called eyepiece projection. Do bear in mind, however, that the shutter time increases dramatically this way. A T-adapter enables you to attach your 35mm SLR camera to the primary focus of your telescope or spotting scope. This is done in photography with shorter shutter times, such as terrestrial photography and photography of the moon and planets. This kind of photography can also be applied in longer exposure and deep-sky photography when using a separate finder. Both a T-adapter and a T-ring need to be used to mount a 35mm DSLR camera onto your optical instrument. Write a review By sharing your experience with the Celestron T-Adapter CGEM Edge HD 8", you can help others (perhaps still doubting customers) with making a good choice.